For comparison, just typing the above names into Google produces about 123,000 results. I got tired of looking through page after page to see where the above search result appeared in the standard Google listing, but it certainly wasn't in the first several pages. Also, I couldn't find these search results on Mocavo either, as it doesn't have nearly as much of the entire internet indexed as Google does (and likely, nobody ever will). AncestorSearch is good at finding this type of buried web page specifically because it starts by taking the widest possible swath of the internet (i.e. all of the internet according to Google), and then filters out the noise with those quotes, pipes, reverse name orders, etc. to produce a much more manageable (and likely more relevant) search result. 2. WHILE YOU'RE AT IT, IGNORE THE OTHER INSTRUCTIONS TOO. Forget that it says "Place" next to that box. Feel free to type in another keyword into the Place box instead. This could be anything, such as an occupation, the surname of a third person you think might be associated with your first two people, or some other keyword associated with your ancestor (e.g. railroad, bank, prison). Also, see that big long box at the bottom of the search form? You can add "exclusion terms" into that. For example, if I know my Majors ancestor above isn't associated with Alexander Majors of Pony Express fame, I can type -Alexander or I could type -"Pony Express" in the long box (that's the "minus" key in front of the words), and pages mentioning the speed-obsessed equestrian are excluded from my search results. Also, if you don't want your own forum postings and such to appear try excluding your own name. "majors william"|"william, majors"|"majors w r"|"w r, majors" "samples samuel"|"samuel, samples"|"samples s"|"s, samples" "cowley"
I hope these tricks help you find a few more buried pages out there and lead to a new discovery or two. 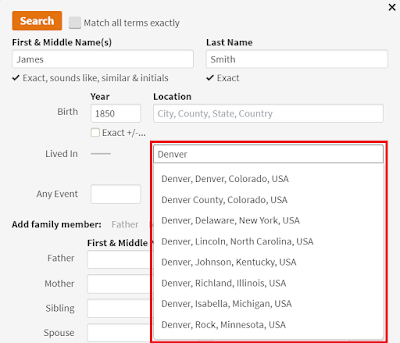 If you have other AncestorSearch tips and tricks that have worked for you, please share them by leaving a comment below.